Eye - Which eyes the prescription line item is for. Brand - The brand name or type of contact lens that your Eye Care Provider has fitted you for. Astigmatism is blurred vision and is caused by an eye that is not completely round. Certain patients require contact lenses that are manufactured for toric or astigmatism correction. Prescriptions for these types of lenses contain two additional numbers that relate to the correction of the astigmatism. These two numbers are usually separated by an "X" and are indicated with the following symbols/abbreviations. Some patients require lenses that are bifocal or multifocal. 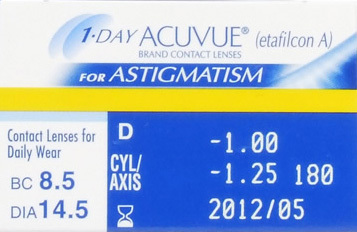 Prescriptions for these types of lenses will contain an additional number with the following symbol/abbreviation. ADD - Also known as "Add Power" or "Extra Strength"
Your prescription will also contain an expiration date. This is typically one to two years from the date that the contact lenses were fitted. Base Curve values range from about 8.0 to 10.0. The doctor fits the lens with the curvature most appropriate for your eye. Most lenses come in several different Base Curve values. If your prescription does not contain a Base Curve value, this is likely because your brand of lens only comes in one base curve. Base Curve values are a bit like clothes sizes - just because you are a Base Curve 8.6 in one brand doesn't mean you will be the same in another brand. Though not common, sometimes you can have a regular prescription for one eye, and a toric or bifocal prescription for your other eye. In this case you will not only have different parameters for each eye, but also usually a different brand/type of lens as well. Take note of the information presented in a prescription, including: power, base curve, diameter and brand name or type of contact lens your Eye Care Provider has fitted you in. Bifocals and astigmatism prescriptions typically have additional information. Read the measurement of the diameter (DIA), given in millimeters; this is the distance from one edge of the contact lens to the other. Read the power (PWR) of the lens strength (it may be different for each eye), measured in diopters. The higher the power number, the stronger the prescription is. Look for a minus sign to indicate nearsightedness (myopia) and a plus sign that indicates farsightedness (hyperopia). Read the base curve (BC) measurement in millimeters. The lower the number, the steeper the cornea of a patient's eye. If this measurement is not included, it is likely that the brand has only one standard base curve value. Locate the brand name or type of contact lens your Eye Care Provider has fitted you in. NEED HELP? We are available M-F 8AM-8PM EST at 855-589-7911. Note: Doctor information is used to verify your order. This is an out-of-network service. Contact your vision insurance carrier for information on full or partial reimbursements.